A vital resource for CEOs, entrepreneurs, and other leaders, bestseller What Great Brands Do: The Seven Brand-Building Principles That Separate the Best from the Rest (#WGBD) paves a clear and accessible road to building a world-class brand. 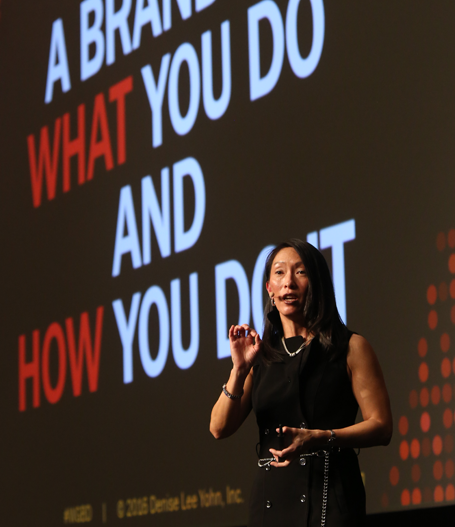 Author and brand expert Denise Lee Yohn identifies the seven key principles behind the world’s top brands and shows readers how they can repeat these principles in their business. Spotting an exceptional brand is easy. Building an exceptional brand, however, can be one of the most overwhelming and elusive challenges organizations face. Many business leaders mistakenly believe that brand-building superstars like Apple, GE, Zappos, and Nike achieved their successes as a result of good timing, years of experimentation, or just plain luck. Denise knows the truth: these companies have employed specific techniques that elevated brand-building from a niche marketing function to the core driver of the business, turning them into industry icons. Yohn knows exactly what it takes to raise a brand to the top and keep it there. Here she shares techniques that can elevate a brand to icon status. Yohn’s book is helpful reading for executives and managers at all levels, and it will guide the next generation of great brands. What Great Brands Do is well-written and insightful… This is a book worth reading over and over. I read your book and my entire company now hears about your teaching every single week. Thank you Thank you. We are on our way to making Vocalink a great company thanks to you! With her finger on the pulse of today’s competitive business landscape, Denise Lee Yohn knows more than most how to create, sustain, and leverage a great brand. Her writing style coaches readers in a warm and conversational way as she offers up-to-the-minute advice, inspiring examples of organizations who have done it right, and cautionary tales of some who haven’t. If you care about building your brand to grow your business, you can’t afford not to read What Great Brands Do by Denise Lee Yohn. Every leader—from CEOs and CMOs to start-up entrepreneurs—will find Denise’s seven brand building principles inspirational and immediately useful. I wish Denise had written What Great Brands Do five years earlier—I would have made it required reading for all P&G brand builders! Denise Lee Yohn beautifully highlights some of the most beloved brands and how they’ve separated themselves from the rest by creating an emotional connection between the organization and its stakeholders. When employees, vendors, customers, and the community feel like a part of the brand, that’s when the magic happens. The Internet has resulted in an explosion of options for consumers and never before have brands and branding been more vital to future of a commercial enterprise. Denise Lee Yohn has bottled the elixir of brands and the magic behind brands in this book. What Great Brands Do is a must-read for leaders who want a fascinating brand. This book is smart, with insider knowledge, and reads beautifully. What I like most is the fresh perspective that Denise Lee Yohn brings to the table – she’s definitely someone to keep a close eye on. The seven brand-building principles of What Great Brands Do represent a provocative view of branding. You will look at brand-building with new eyes. Chock full of provocative insights, compelling case studies, and practical tools, What Great Brands Do demystifies the brand-building process and shows business leaders how to revitalize and strengthen their brands. If, like me, you’ve never been a ‘brand person,’ let Denise Lee Yohn be your guide in building your brand into your business. Follow her principles, embrace her tools, and execute through every single thing you do. As she taught me, that’s what great brands do. While brands have become increasingly complex and challenging to manage, Denise has done a terrific job of breaking down what matters in building brands that don’t just thrive, but win. Case Studies that Analyze the Brand-Building Successes and Failures of Top Companies. Examining how this approach operates in the real world, What Great Brands Do features case studies from companies including Google, Trader Joe’s, IBM, Patagonia, Shake Shack, and many others. Demystifies the Brand-Building Process by Laying Out Clear Action Steps. These philosophies contribute to Denise’s innovative brand-as-business approach, which puts the brand at the heart of every company decision and fuels faster growth, increased profit margins, stronger corporate cultures, and superior stakeholder relationships. 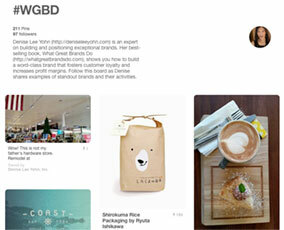 Want to join the conversation about What Great Brands Do (#WGBD)? Denise is creating a virtual collage of great brands in action and invites your contributions via social media. To participate, please take photos of great brands you see and tag them with the hashtag #WGBD on Twitter or Instagram — or find and follow the #WGBD board on Pinterest. Join the exclusive list of CEOs, entrepreneurs, and other business leaders who receive Denise’s email briefings on brand leadership and receive a free chapter from Denise’s book — What Great Brands Do: The Seven Brand-Building Principles That Separate the Best from the Rest. Sign-up using the form below.